The spectrum of seasonings and flavors found in Slap Ya Mama Cajun Gumbo Dinner Mix lends itself to a multitude of applications, but I thought it was best suited for seafood, particularly shrimp. 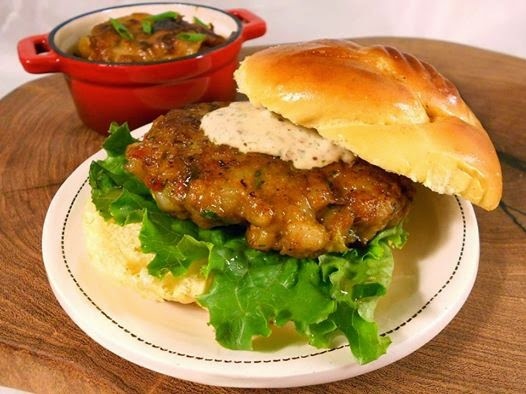 What better way to celebrate the bonanza of gumbo than in a shrimp burger? The flavors are perfect here - just the right amount of Cajun spice to grab your attention; the purity of the ingredients lets every bit of shrimpy goodness shine through. If you have time, chop your shrimp by hand; it makes for a much more interesting burger! Make the Spicy Sauce: Whisk together all ingredients in a nonreactive bowl. Cover and refrigerate for several hours or overnight. Stir before serving. For the burgers: In a large, nonreactive bowl, combine shrimp, egg, breadcrumbs, celery, peppers, parsley, onion, lemon juice and zest, garlic, salt, Slap Ya Mama Cajun Gumbo Dinner Mix, and Slap Ya Mama White Pepper Blend Cajun Seasoning. Mix well, and shape into patties of equal size. Cover and refrigerate for two hours, and up to eight hours. In a large skillet, heat olive oil and butter over medium-high heat. Cook burgers approximately three to four minutes per side, until firm and cooked through. Remove from skillet and drain on paper towels. Toast buns if desired, and spread with Spicy Sauce. Place lettuce on bottom bun and top with burger. Add more Spicy Sauce if desired and close with top bun. Eat with abandon.